I recently discovered. They prevented no less than three separate toilet stops and the boys thought it was hilarious! Our friends live just off the M4 yet on the edge of the Brecon Beacons and Carreg Cennen Castle was a short drive across moorland and through valleys which reminded me of our pre-children hikes in the Peak District – intriguingly alternative to the Cornish hedges and green hills down here. 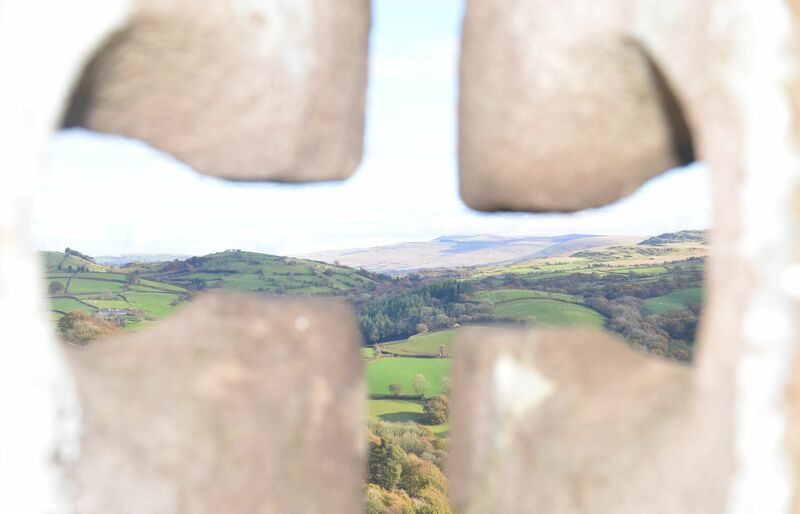 Built upon a huge limestone crag nearly 90 metres above the river Cennen the Castle has utilised the natural defensive qualities of it’s position. It dominates the skyline from miles around and it’s easy to imagine why people dating as far back as the iron age occupied it as a stronghold. View from the arrow loops. 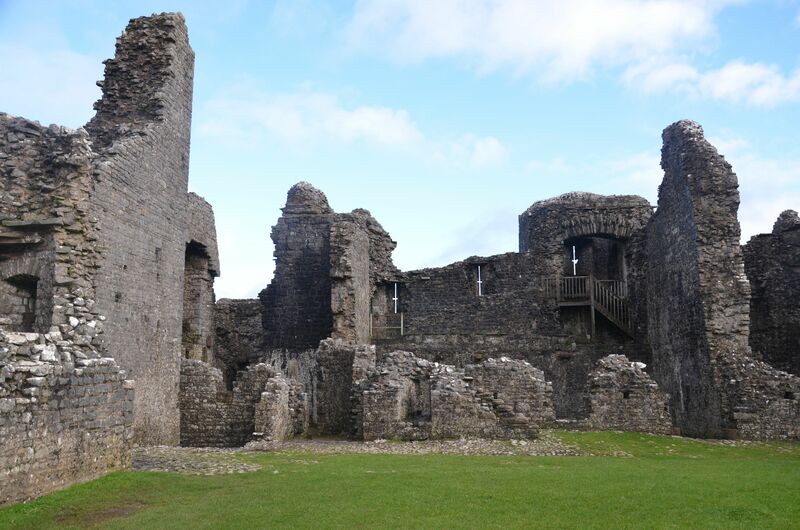 The Castle as seen now was build in stages during the end of the 13th Century and start of the 14th Century and has a bloody history of battles and wars, including the Wars of the Roses (1455-85). However it was deliberately ruined in the Summer of 1462 on behalf of the Yorkist king, Edward IV, who had just won it back from the a Lancastrian supporter, Gruffudd ap Nicholas who was using it as a garrison. They destroyed it so it would not be used by the enemy again. It has laid there in ruin ever since. For me the magic was in the ability to see how people lived there. The domestic quarters are surprisingly in tact so you can make out the kitchen, various private chambers and even toilets – always fascinating to our boys (oh okay, us too). You can see various stair cases twisting up the towers and picture the people using them all those centuries ago. In the inner ward the massive oven is still visible and of the style of modern pizza and bread ovens which are still fashionable and functional today. 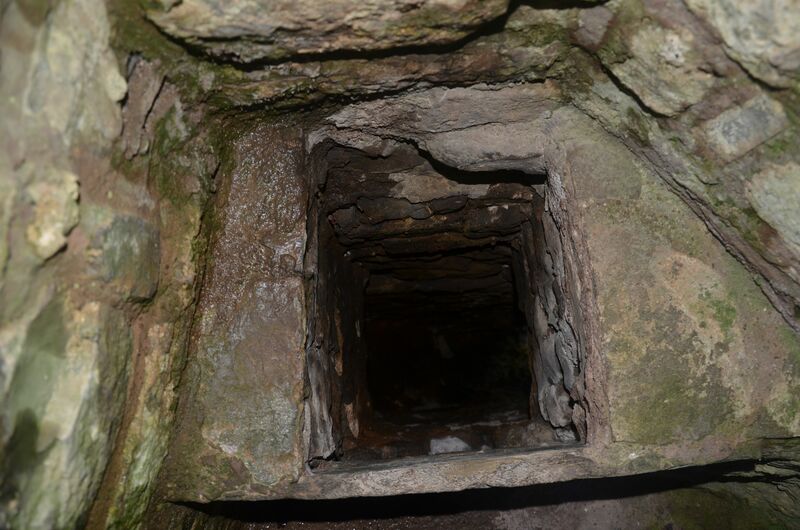 Most intriguingly is a long dark tunnel which runs under the castle for some way but leads only to a chamber at the end. It’s not sure what the purpose of it was but, considering the effort it would have taken to create, there must have been a good reason for it. The tunnel and cave is covered in graffiti mostly from over 100+ years ago which is fascinating in itself. Not only picturing the medieval knights and princes but the Victorian tourists making their way along the tunnel with candles and ridiculous shoes, scratching their names and dates – claiming their own little victory over the Castle and mortality. I didn’t get a picture down in the cave because I was concentrating hard on getting both me and my kids down it and back out alive – sorry about that. You need to take a torch as it’s pitch black, although you can hire them from the shop. After exploring the castle as extensively as possible with a gaggle of children in tow we headed down to the shop and café for lunch. 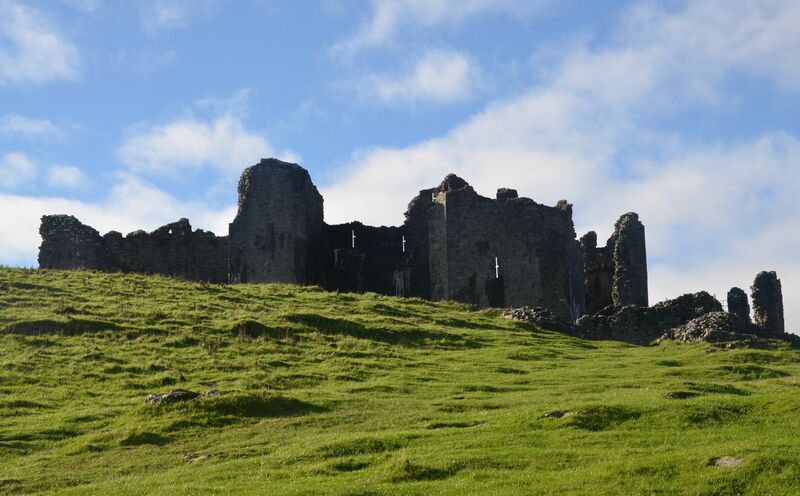 Castell Farm surrounds the Castle and is run as a Welsh upland holding with rare breed sheep and cattle. The meats from the animals can be sampled in the café with Longhorn cottage pie and other hearty dishes. The kids were welcome and prices reasonable. 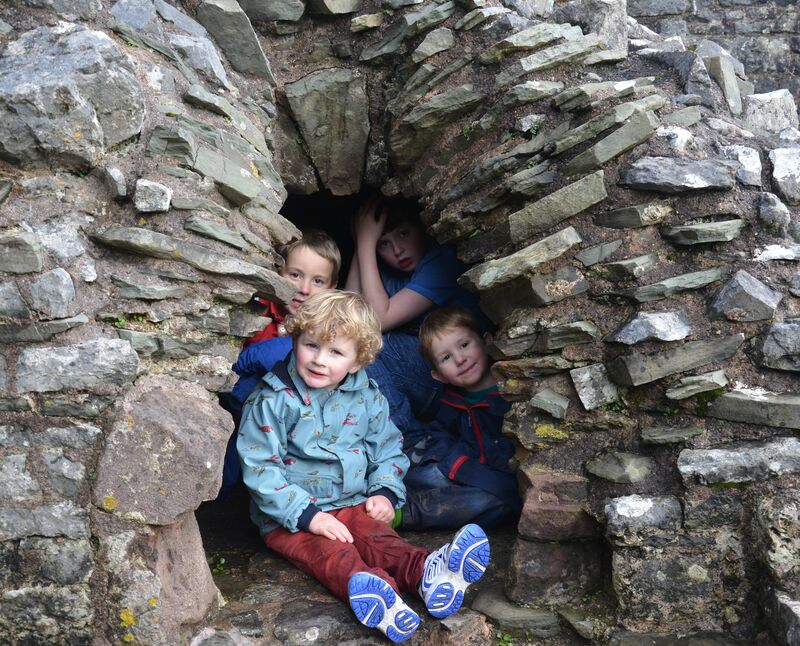 It was a fantastic day out, ideal for families of all ages as the paths are easy and the castle is interesting for all. You could probably do it with an off road buggy but we used an Ergo Carrier for Orla. You wouldn’t be able to do the cave with a pushchair or with a big backpack. A great place to play knights and dragons! A medieval toilet. The waste just headed out of a hole in the outer wall of the castle. It’s easy to see why they build it here with a defensive view from all angles. 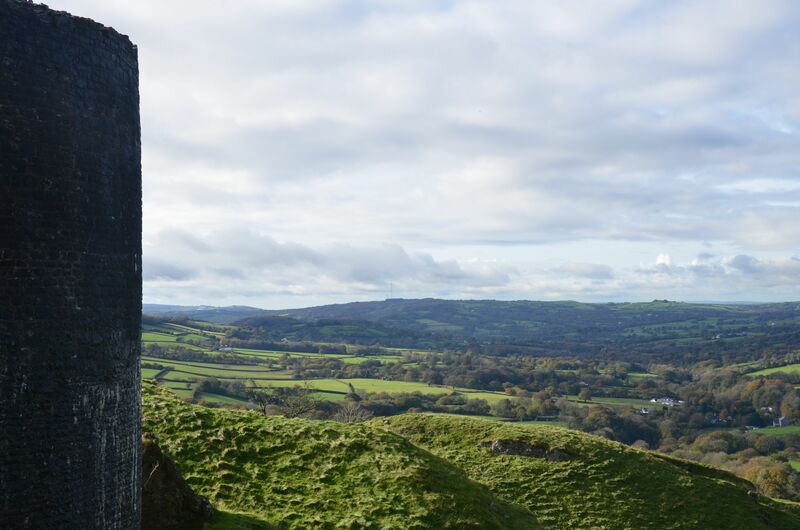 Carreg Cennen is an imposing feature on the surrounding landscape. 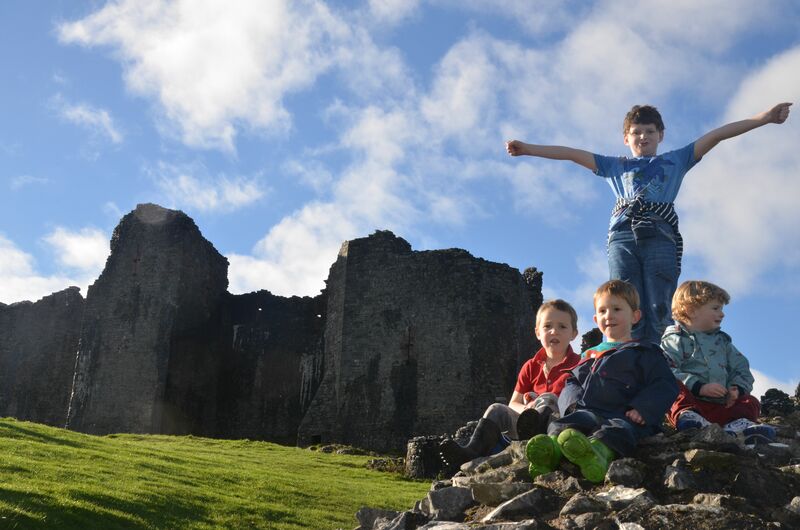 This entry was posted in Uncategorized and tagged adventure, brecon beacons, Carreg Cennen Castle, caves, days out with kids, Family Travel, history, medieval history, photography, Wales, wars of the roses on November 11, 2013 by Muma Dean.